On Oct. 1, the Sankei Shimbun reported that during a regularly scheduled press conference, NHK President Katsuto Momii addressed statements made by “former NHK employees” who told media outlets that the public broadcaster had “received phone calls from the prime minister’s office” regarding passage of the contentious security bills in September. Momii insisted these phone calls “never happened,” and that “there was no interference at all.” NHK’s coverage of the bills’ passage had not been biased in favor of the government, he added. Had Sankei not included this last line in its coverage, the public likely would have never heard the word “Abechanneru,” a neologism combining “Abe,” referring to Prime Minister Shinzo Abe, and “channeru,” meaning “TV channel,” in this case NHK. The joke is that NHK belongs to Abe, but it was only a joke shared by some people on the Internet. Thanks to Momii and Sankei, everyone can share it now. Because the Diet has to approve NHK’s budget, there has always been some suspicion that NHK serves the government, despite its repeated assurances that it doesn’t. But ever since the second Abe administration took power, this suspicion has been inflated due to the way the prime minister handles the media. A case in point is the press conference that followed Abe’s re-election as Liberal Democratic Party president in early September. Some commentators have pointed out that his resumption of the prime minister’s post doesn’t have a mandate because it wasn’t approved by the public, only the LDP. Some media also reported that Abe’s team had exerted pressure on supporters of Seiko Noda, the only LDP member who had entertained the idea of challenging his presidency, so that she would drop out, which she did. These are matters that should have come up at the press conference, but they didn’t. That’s because Abe and his handlers choose which reporters will ask questions, and, according to freelance journalist Tetsuo Jimbo, they always choose people they know will ask questions he can answer easily. One of these people is Seiki Hara, the NHK staff reporter assigned to the prime minister. During a recent discussion on the website Videonews.com, Jimbo described the post-election press conference. When questions were solicited, dozens of reporters raised their hands, including Jimbo, but the first person called was Hara, even though he didn’t raise his hand. Hara asked about Japan’s current GDP, and Abe answered, as he always does, reading from his notes. The other questions were equally weak and none touched on the ostensible reason for the press conference — Abe’s re-election. Jimbo says that while Abe’s answers were scripted, that doesn’t necessarily mean the press conference was. As long as the prime minister (or the emcee) calls on people who understand Abe’s limitations and what is expected of them, they won’t make his job difficult by asking questions for which he doesn’t have prepared answers. The situation is different in Diet debates, but there Abe is always backed up by an aide or bureaucrat who can coach him on the spot toward some vague rejoinder. With the press, all he has to do is know which reporters to point to. 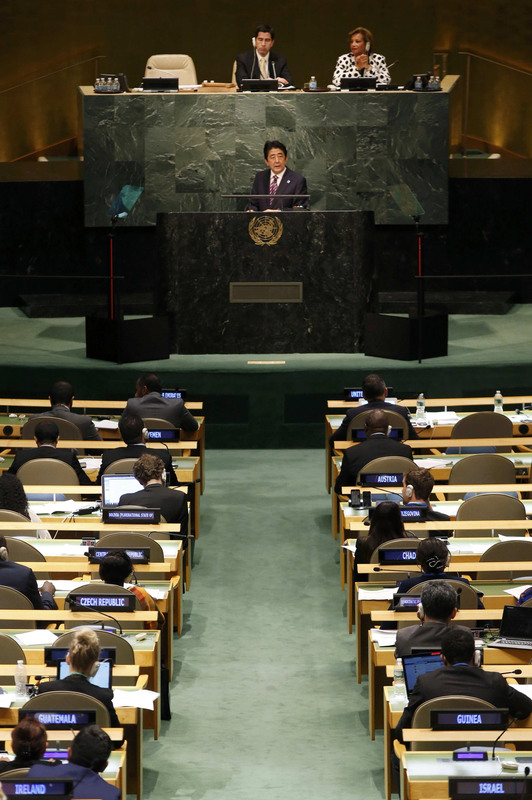 The exception that proves this rule was the Sept. 29 press conference Abe held following his speech to the United Nations in New York. Jimbo points out that not many people in Japan know about the press conference because it was barely covered by the domestic media. 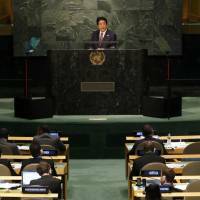 However, it was covered extensively overseas because of what Abe said about Syrian refugees — namely, that before it could accept any Japan needed to do “many things,” such as making more “activities” for women and seniors and “raising the birthrate.” Some overseas commentators took this statement to mean that Japan will not pull its weight in line with other developed countries, many of whom have pledged to take in refugees, and they’re correct in that the remark reflected Abe’s thinking on the issue. But it also indicated something else. Two reporters later, a woman from National Public Radio followed up a prearranged question with an unexpected one about the U.S. military dumping toxic substances in Okinawa, but this time Abe just ignored the second part of the query. Miyadai commented that a person like Abe has to be “protected” from the press — he isn’t knowledgeable enough to field questions the way a real leader should. But the problem is the media, which puts up with the administration’s stonewalling. Just imagine how different things would be if they actually did their job.